Ratrod Studio Inc.  announces their upcoming mobile racing game, Drift Mania: Street Outlaws . This new title is the latest of their popular Drift Mania franchise which was downloaded by over 20 million players worldwide. Street Outlaws takes the heat to the streets allowing players to battle and compete in underground drift events based on various world locations. From Japan, where it all began, to the Swiss Alps, Desert Canyons and the steep hills of San Francisco, Street Outlaws will take you to the edge of your seat while drifting around some of the most hazardous roads. “There was a lot that we couldn’t do with the Drift Mania Championship titles since they were tied with an official drift league. We really spoiled ourselves with Street Outlaws allowing players to take it to the street without any rules or guidelines. This has been our fans’ no. 1 request since the launch of the original Drift Mania game back in 2010.” says Ratrod Studio’s President Pat Toulouse. 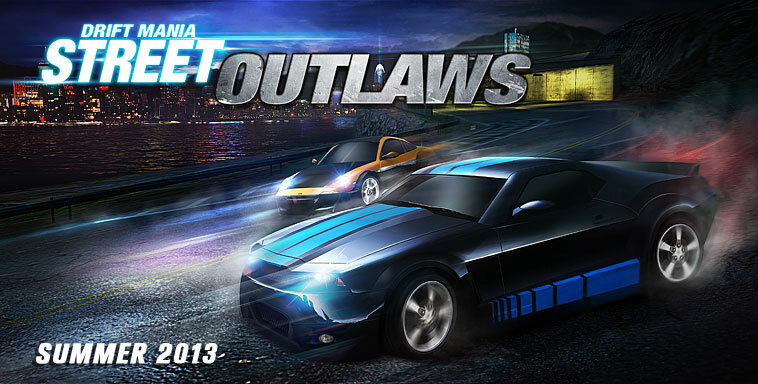 Drift Mania: Street Outlaws has been confirmed for release early summer 2013 and will be available on all popular mobile gaming platforms including Windows 8 and Windows Phone. 13 vehicles with fully customizable controls, a virtual steering wheel mode and gyroscope support. Career modes which includes over 12 courses and 60 achievements. Extensive customization modes for vehicles including custom paint colors, body kits, after market wheels, window tints and spoilers as well as the ability to adjust different aspects of the car including the suspension damping, steering sensitivity, gear ratio and weight distribution. Drift battle tournaments to test your skills against real-time opponents using the local or online multiplayer mode. Share and brag using social media platforms including Facebook and Twitter. Available in the following languages: English, French, German, Italian, Spanish, Russian, Japanese, Korean, Portuguese and Chinese. 2 Comments To "Ratrod Studio Announces Drift Mania: Street Outlaws for Summer 2013"